I've been a Nail Tech for almost 10 years now, and you can imagine how excited I get anytime I can try some hand/nail products. The ultra famous Weleda brand, leader in the field of natural cosmetics, kindly sent me this hand/nails kit to test. These products are part of the Pomegranate collection. Let's start with the Pomegranate Regenerating Hand Cream. This is actually an anti-ageing hand cream and it won the Cosmopolitan Prix de Beauté in 2010 so you might have already heard about it. Rich in organic shea butter, that protects from moisture loss, and plant extracts that stimulate cell renewal, this cream will protect your hands from all daily enemies, such as wind, water, soaps, etc. Everytime I wash my hands they look so wrinkly and rough after. I've started using this cream regularly and I can tell you that my hands look much softer, smoother and firmer... actually younger! I would recommend this cream also because it's not greasy and smells amazing! 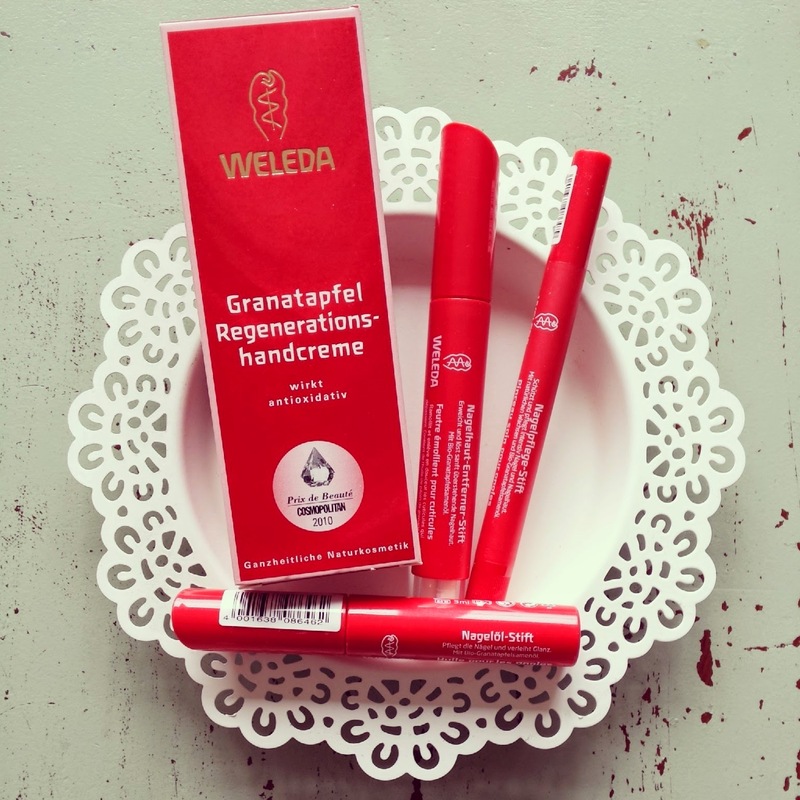 When it comes to new products Weleda has launched 3 super practical and easy-to-use nail pens. The Cuticle Remover Pen, that contains organic pomegranate seed oil, is the best way to gently remove cuticles. Simply apply the product directly on the cuticle area, let soak for a while and then push back with the cap of the pen. It works perfectly and this should always be the first step of your manicure. The Nail Care Pen also contains organic pomegranate seed oil and it is meant to protect your nails and cuticles. If you suffer from very dry hands, or if you're washing your hands many times a day, you should use a specific product for your nails and cuticles. This is actually a brush, so it is even easier to apply the product, just like a nailpolish. The Nail Oil Pen protects and restore your nails and cuticles leaving a beautiful shine on your nail plate. I would suggest this product for example to those who have just removed artificial nails, in order to restore the natural balance of the nail. If you don't like nailpolish but want nice and shiny nails this could be the right product for you. This brand is simply amazing! Hope you like it.